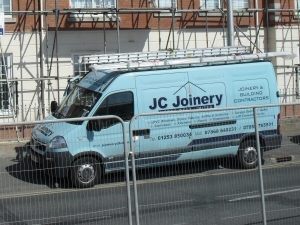 J C Joinery van on location at a job in Thornton CleveleysBased in Thornton, Lancashire, J C Joinery are joinery and building contractors offering domestic and commercial services throughout the Fylde Coast and wider North West area. Double Glazing, Soffits, Fascias and Guttering - Make painting a thing of the past. We install good quality UPVC, available in a variety of colours. Extensions, Brick Garages, Conservatories, Orangeries - From a porch upwards, we can do it all including electrics, plumbing and all fixtures and fittings! Fitted Kitchens and Bathrooms - Replace your entire kitchen or rejuvenate your units with replacement doors and fittings. Garage Doors - We fit all manner of garage doors, including sectional, electric and up and over. Loft Conversions, Garage Conversions - Can't afford to move right now? Why not make use of the space you have? Property Refurbishment - From cleaning out through to putting up curtains, deal with one company from start to finish! UPVC Window and Door Repairs - Repairs and replacement of UPVC windows, doors, locks, handles, hinges and more. Disabled Access, Adaptations, Ramps and Bathrooms - We can provide advice on how to make your home more comfortable and safe. Laminate, Hardwood, Engineered and Solid Oak Flooring - Professionally fitted to ensure no buckling or damage during installation. Log Cabins, Summer Houses, Garden Offices, Hobby Rooms, Tree Houses - Considering a log cabin? We can prepare bases, supply if required, assemble the cabin and / or fit it out with electrics and all furnishings. To get a no-obligation quote, please give us a call. All work considered. Whatever the job, you can be assured of a reasonably priced, reliable and professional service. For examples of our work, have a look through the photo galleries on many of our pages. References from previous customers are also available on our Testimonials page.